Auckland Libraries, Sir George Grey Special Collections, Med. MS G.145 (Margaret M. Manion, Vera F. Vines, and Christopher de Hamel, Medieval and Renaissance Manuscripts in New Zealand Collections (Melbourne, London and New York: Thames and Hudson, 1989), no. 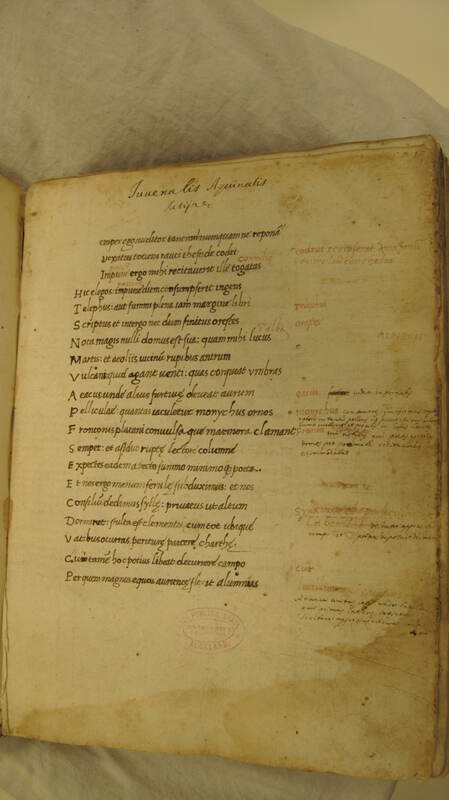 24); Juvenal, Persius, Satyrarum Opus, Italian, fifteenth/sixteenth centuries. 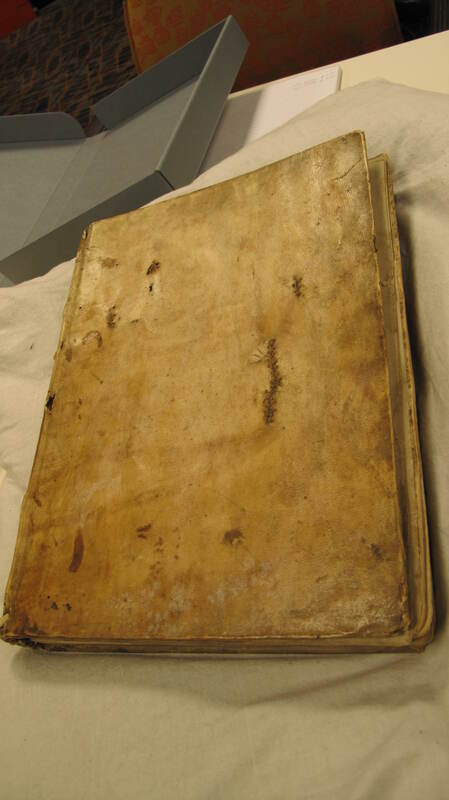 The binding is an example of a parchment cover over paper pasteboards. In Italy, pasteboards “had become the generally accepted replacement of the wooden boards around 1470”. The text block has been sewn onto three double, tawed supports, which have been laced into the boards. There is one endband at the head, sewn in plain thread on a single core; the sewing attaches the endband to the quires, and the core has been laced into the covers. 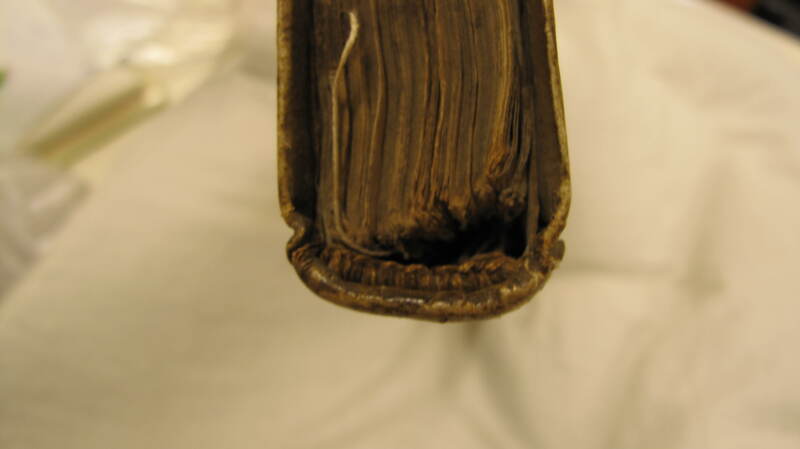 This appears to be the manuscript’s earliest binding, probably contemporary or near contemporary with its copying. This makes the pasteboards New Zealand’s earliest surviving example of this ancient technology. Like books bound in parchment, books bound in light pasteboards were easier to handle, store, and transport than those bound in wooden boards. The earliest known bookbindings, on the Coptic “Nag Hammadi” codices from the second century AD, are parchment covers over pasteboards made from layers of glued-together papyrus sheets. In the later Middle Ages boards were made from leaves of parchment and paper, glued and stitched together. Some of the manuscript fragments found in many modern libraries are from such bindings, which could be “homemade” from materials ready to hand: the adhesive used was usually flour and water. The pasteboards on G.145 represent the commercial development. In the fifteenth century pasteboards were mass produced (as was the pulped paper from which they were made and the printed books that they sometimes bound). The pasteboards on G.145 are an example of the new practice. European customs records—the London port rolls from 1506 for example—contain entries that show that pasteboards were imported in large numbers from continental paper-making centers. See also Migrations: Medieval Manuscripts in New Zealand, ed. Stephanie Hollis and Alexandra Barratt (Newcastle: Cambridge Scholars, 2007), 35, 57, 99, 100. See J. A. Szirmai, The Archaeology of Medieval Bookbinding (Farnham: Ashgate, 1999), 224. Szirmai, Archaeology of Medieval Bookbinding, chapter 1. R. Reed, Ancient Skins, Parchments and Leathers (London and New York: Seminar Press, 1972), 46-55. Nicholas Pickwoad, “Onward and Downward: How Bookbinders Coped with the Printing Press 1500-1800,” in A Millennium of the Book: Production, Design and Illustration in Manuscript and Print, 900-1900, ed. Robin Myers and Michael Harris (Winchester: St Paul’s Bibliographies, 1994), 61-106 (79-80). In the London Port Rolls (Henry VII-Mary), The National Archives, PRO class E 122 – 80/4 (1506-07) contains the first references to the importation of boards, probably pasteboards, to England, some by the printer Wynkyn de Worde (m. 10v-11v). Thanks to Peter Blayney for directing us to this source.